Girl is NOT a 4 Letter Word: Who's Rad? Carly Bizama. When the new Maryhill She Ride event poster was released on social media all we could do was stare at it, the drawing was so realistic and the attention to detail was amazing! It was like you were there. So we set out to find out who did this drawing & we were stoked to discover that it was Carly Bizma who is a downhill skater herself. Read on to hear about how Carly combined her two loves, skateboarding and art, and what she's up to next! Who's Rad? Carly Bizama aka "Gnarly Carly"
Home is? I'm from Santiago, Chile but my home is in Concord, CA now. I started skating around 2012 but I didn't get into downhill skating until mid 2013. I always wanted to skate since I was little but always felt it was something I couldn't do. Then when I was about 21 I was going through some hard times and I decided to pick up something new to lift myself up, so I started skating. It turned out to be exactly what I was missing in my life. Your artwork is amazing - can you tell us how you got started? I got started very young, when I was about 6 years old I used to draw cartoon network characters and sell them to my classmates haha. I have always loved to draw from pictures so I eventually got into realism. What is your favorite medium to work with – charcoal, pencil, etc? By far my favorite is charcoal pencil, I've always loved graphite pencil but using black and white charcoal on toned paper makes the process so much more fun! Your charcoal drawings look exactly like photos – in fact I did a double take on a couple of them thinking they were black and white camera shots – how long does it take you to do something as realistic looking as these beautiful pieces? It depends on the drawing but for example I've made some 8 x 11 drawings in about 15 hours and then some other bigger ones like 18 x 24 in have taken me up to 30 hours or even more. 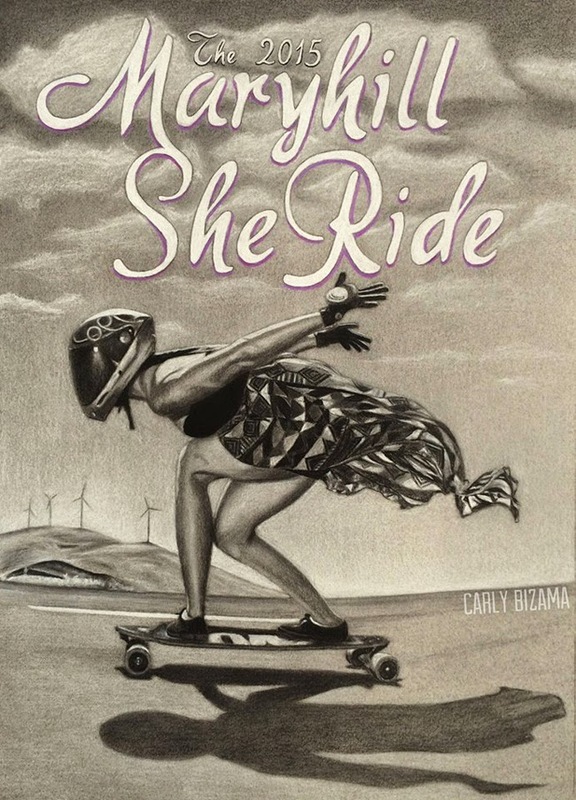 You have also combined your two loves – skateboarding and art - with the new, and amazing, Maryhill She Ride poster – how did that all come about? Thanks! Well I did a few drawings of girl skaters that got some attention and from there I was lucky enough to have people from the skating community contact me to draw them their own skate portraits. And so I was commissioned to make the poster for this rad event which by the way it was something I always wanted to do, so it made me really happy when Maryhill Ratz contacted me. I noticed you also did a design for your grip tape that was stunning – are all your boards custom grip by you? Thank you! Yes, all of my boards are painted by me, except for my downhill set up since the griptape is too coarse. What about your helmet – does it have your art work gracing it? My helmets don't have any art by me yet but that is something I plan to do, I really want to paint my full face helmet at some point. Will you be competing at Maryhill? I won't be competing at Maryhill but I will be going to the SheRide and possibly the fall freeride. I just really like to skate for fun and racing is not something that I'm super interested in or I feel ready for right now. 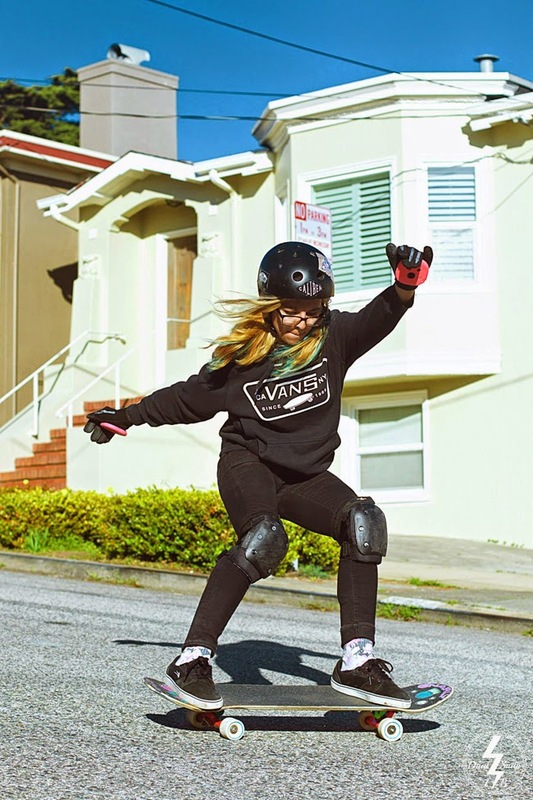 What advice would you give to another girl who wants to get started longboarding? I would say do it! Be prepared to fall and get back up, don't be shy and reach out to other skaters, challenge yourself, but most importantly have fun! Are there any women out there doing rad things that inspire & motivate you? Definitely! First one that comes to mind is my friend Alicia Fillback, she is a badass skater and amazing artist too. She is a huge inspiration for me and she is also the first skater I drew! :) She has her own brand The Animus Code worth checking out! Other girls skaters that inspire me are Carmen Shafer, Yvonne Byers and Jennifer Zi; all amazing skaters and people. Any healthy eating habits that keep you energized you can share with us? I actually went vegetarian the same week I got my first board, and it has definitely helped me become healthier and feel better about what I eat. Favorite place you've ever skated? I can't really think of a single one but my favorite thing to do is to skate in SF, whether at the skatepark or skating hills San Francisco just makes me so happy! I really like sit down slides! Those were the first no hand slides I learned and I just love them, sit down checks just feel so right. I don't have any sponsors but I would like to give a shout out to Team Killsauce, 1triprotective and Remember Collective who have hooked it up before, thank you! And also to all of my friends that have helped me out with gear at some point. I'm really grateful for all the awesome people that make up the skating community. 1. I was bit by a monkey at the zoo when I was 8 years old. 2. I moved to the US when I was 16 years old and I learn most of the slang from watching Family Guy. 3. I collect books about artists and occasionally children's books when I find they have cool illustrations. I don't have many solid plans for the year but I'm hoping to make it to more skate events than last year, make prints of my drawings and I also want to start designing board graphics.